Grand Cayman is the largest of the 3 islands that make up the Cayman Islands. Located south of Cuba and to the east of Cancun Mexico, it is a very popular year-round cruise ship and Grand Cayman cruise shore excursions stop. 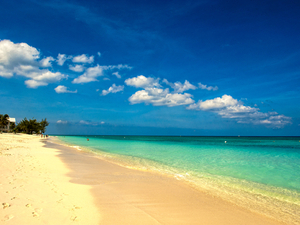 Grand Cayman has been a favorite destination of vacationers and the island's 7 Mile Beach is full of 5-star resorts. Maybe "Cayman" is best known for the incredible marine life and has been a long time hot spot for scuba divers and snorkelers. The famous Stingray City excursions allow guests to interact, snorkel and touch these docile marine creatures. We offer the absolute best options for your tours and cruise shore excursions in Grand Cayman! Convenient meeting location very close to your Grand Cayman cruise ship terminal! Guided jet ski adventure to Stingray City! Guided snorkeling to a beautiful coral reef! Small groups only, escape the cruise ship sponsored crowded shore excursions in Grand Cayman! 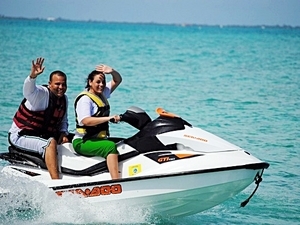 Book early, this Jet Ski cruise excursion in Grand Cayman is extremely popular! 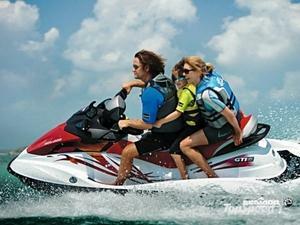 Enjoy some high speed jet ski fun in Grand Cayman. Visit Stingray City and enjoy a guided snorkel at the Coral Reef. Round-trip transportation from your cruise ship tender in Grand Cayman! English speaking, friendly excursion guides! 3-hour beach break (4 hours including transportation)! Access to facilities: restaurant, beach bar, restrooms, showers, and changing rooms! Visit the famous 7 Mile Beach with transportation included. Enjoy any of the restaurants and shops that are located along the beach or just simply put your towel down and enjoy the sun. Round trip transportation from your Grand Cayman cruise ship terminal! Jet ski fun to the 2 famous spots - Stingray City and Starfish Beach! Great snorkel and interaction time, fully guided with licensed shore excursion guides! Optional drop-off at famous 7 Mile Beach! 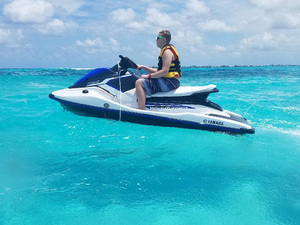 High-speed jet skiing Grand Cayman Excursion with excellent snorkelling at two premier locations - Stingray City and Starfish Beach. Boat ride to 3 great snorkeling sites in Grand Cayman! Visit the world-famous Stingray City, Coral Gardens and Barrier Reef! THREE stops to see the best of Cayman snorkeling and Stingray City on this Grand Cayman Snorkel Cruise Excursion! Pickup from the cruise ship pier! Round-trip transportation from your cruise ship tender terminal in Grand Cayman! Local experienced Grand Cayman captain and crew! Boat ride on a comfortable vessel with marine toilet on board! Entrance fee to the Marine Park of Cayman Islands! English speaking, friendly snorkel excursion guides! Guided snorkeling at: Stingray City, Starfish point, and Coral Gardens! Bottled water on the boat! Experience the beautiful waters of the Cayman Islands by boat with this fun-filled day. Swim with friendly stingrays, snorkel over a colorful reef, and then see where the starfish hang out all day. Boat ride on a comfortable 48 ft vessel with marine toilet on board! Guided snorkeling at Stingray City and Coral Gardens! 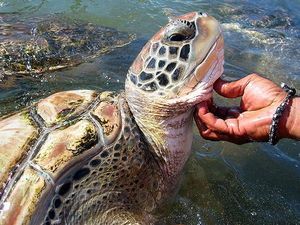 Turtle Farm visit including access to turtle touch tank and wading pool, crocodile viewing, and much more! For all those who love nature and wildlife, this Grand Cayman Excursion is for you! Stingray City, snorkeling at famous Coral Gardens and Turtle Farm exploration! Come with us and discover the world both above and below the lovely waters of Grand Cayman. Educational and a fun family shore excursion! 2 great sites to visit and snorkel on this Grand Cayman Snorkeling Cruise Excursion! See the world-famous Stingray City and captain's choice coral reef snorkeling! 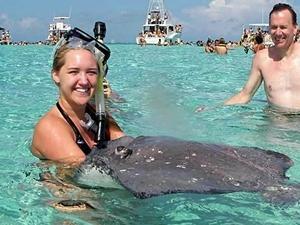 On this Grand Cayman Snorkeling Shore Excursion, enjoy both the famous Stingray City Sandbar and one best coral reef snorkel site of captain's choice! RT transportation from your cruise terminal included. Complimentary drinks such as bottled water and soft drinks! 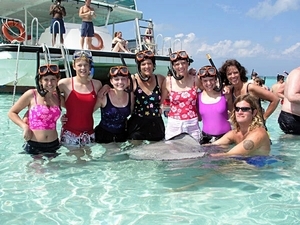 This Grand Cayman Catamaran Cruise Excursion to Stingray City is also available as a private charter excursion option! 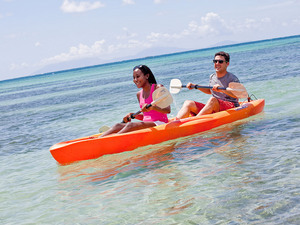 Small groups, max of 20 guests per departure, escape the crowded cruise ship sponsored shore excursions in Grand Cayman! A fun day with catamaran sailing and snorkeling along with a visit to Stingray City to interact with the rays. Roundtrip private transportation from convenient meeting location close to your Grand Cayman cruise ship tender terminal! English speaking certified guide and staff! You choose the private charter cruise excursion length and number of stops! Option to choose from the following sites: Stingray City, Starfish Point, Snorkel at Barrier Reef or Coral Gardens, Booby Key Mangrove Forest, Rum Point Beach or Kaibo Beach! Complimentary snacks and drinks (chips, granola bar, bottled water and soft drinks)! A luxury private motorboat with a maximum of 9 guests! Escape the crowds and enjoy your day on a private boat charter with your choice of the snorkel stops you want to visit. You will have 3 to 4 options to choose from. 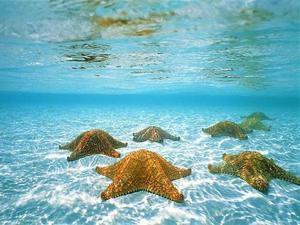 You can snorkel, swim with the stingrays, admire the beautiful starfish, or relax on a beach. Travel in style with just your friends on this luxury motor boat. Your personal SeaDoo PWCs (Jet Skis/Wave runner), speeds up to 50mph! Safety and operation briefing for the Jet Skis! Private, English speaking Jet Ski Wave runner Grand Cayman Cruise Shore Excursion guides! Private Guided Jet Ski / Wave runner Cruise Excursion! Visit two sites of your choice: Stingray City, Starfish Beach, Snorkel at Barrier Reef or Coral Gardens or Rum Point Beach! Great staff and personalized service! Optional drop of at 7 Mile Beach! Private, customized jet ski fun! Nothing beats a day in the sunshine, gliding along the turquoise waters on your very own jet ski. Opportunities to enjoy quintessential Caribbean beaches and explore sea life in their natural environment make this the perfect excursion for you. Local experienced Grand Cayman Snorkel Shore Excursion captain and crew! Guided snorkeling at Stingray City Sandbar and Coral Gardens Reef! Cold bottled water on the boat! 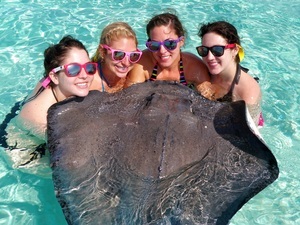 This is without doubt one of the most popular Stingray City and Snorkel Shore Excursion in Grand Cayman! 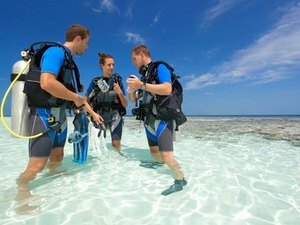 Enjoy the friendly encounter at Grand Cayman's famous Stingray sandbar and snorkel at the unique reef formations at Coral Garden's! Round trip transportation from your Grand Cayman cruise ship terminal included! 2 great cruise excursion sites to visit and snorkel in Grand Cayman! Complimentary fruit punch and water onboard! Enjoy the world famous Stingray City and Barrier Coral Reef! Enjoy 2 iconic Grand Cayman cruise shore excursions - coral barrier reef snorkeling and interacting with rays at Stingray City! Large, comfortable boat. RT transport from the pier too! All safety instructions and necessary equipment included! Fun and easy to use ocean kayaks! Sit-on-top kayak...great fun kayaking cruise excursion for novices and experienced. Relax on the beach after you paddle in the clear, warm Cayman Islands water! English speaking certified jet ski guide! 30 minutes or full hour aboard 1500cc Sea Doo Wave Runner Jet Ski / Wave Runner! Solo or double rider jet ski rental price is the same, all fees included (also fuel and insurance)! Everything you need for a fun half hour jet skiing out on the Grand Cayman waters. Solo or double, same price. Enjoy this jet ski / waverunner rental. Convenient meeting location from your Grand Cayman cruise port tender pier! 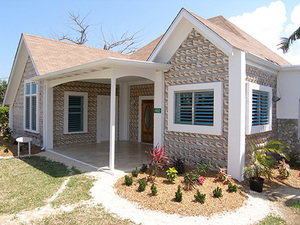 Grand Cayman Marine Park permit and fees included! Super personalized service, only 4 beginner SCUBA divers per dive excursion instructor! Venture below the surface just like a real diver, for beginners with no prior experience. 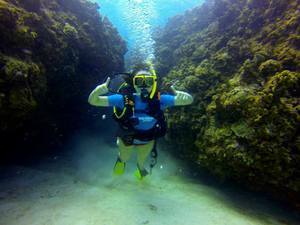 Dare to Discover SCUBA Diving in Grand Cayman! Round trip transportation from your Grand Cayman cruise ship terminal area! All necessary jet ski information and safety instructions! Jet ski ride to Stingray City, solo or double jet ski excursion riding option! 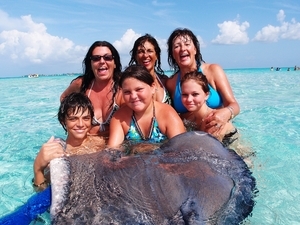 Join us for a fun guided Grand Cayman jet ski excursion to Stingray City to interact with the rays. Enjoy beach time too! English speaking PADI certified instructor! Complimentary bottled water and snacks on board! Super personalized service, only 8 participants per scuba diving shore excursion boat! Submerge in this World Class Diving! This two tanks Grand Cayman diving excursion will take you to the best wall and reef locations in the island. Enjoy a relaxing day with our experienced, friendly crew! Maximum of 20 guests on this private catamaran charter shore excursion! See the famous Stingray City with one of the best local operators! We offer this excursion on a shared basis as well, check our Stingray City Catamaran Sail and Snorkel Excursion! 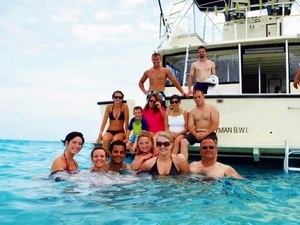 A fun day with private catamaran sailing and snorkeling in the Caymans! Visit Stingray City to interact with the rays and snorkel at the colorful Barrier Reef from your private charter! English speaking certified captain and mate! Complimentary bottled water and fruit punch! Your private boat charter shore excursion - pick the size of the boat, how many friends you bring (see shopping cart options)! Enjoy a fun half day of quality deep sea fishing on your private charter! Round trip transportation included from your Grand Cayman cruise ship terminal! 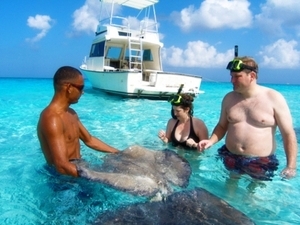 Tailor make your day on your own private charter shore excursion in Grand Cayman! Choose the size of the boat (see shopping cart options)! Local licensed snorkeling excursion guides! Escape the large cruise ship crowds on your own private snorkeling boat. Depending on what you want - 3 hours of snorkeling fun 34' or 60' boat. Round trip transportation from your Grand Cayman cruise tender terminal! Visit Heroes Square, King George Watch and Conch Shell House! Beach break at Seven Mile Beach! Free WiFi in Seven Mile Beach! Optional shopping time at George Town Shopping District and 15% discount on selected items! Come and spend the day learning about the history of Grand Cayman and relax on Seven Mile Beach! Sightseeing of the Governor's Mansion and Old Homestead! Photo stop and shopping time at Hell! Beach Escape at Seven Miles Beach! Complimentary WiFi at Seven Mile Beach! Optional stop at George Town Shopping District! 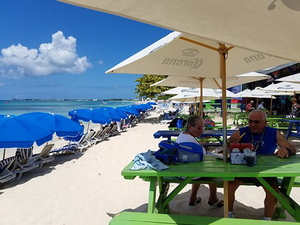 Go to the Hell and back to then enjoy a perfect day at one of the best-rated Grand Cayman Excursion in this beautiful beach, Seven Mile Beach! Come relax and have fun! Access to facilities: restaurant, beach bar, pool, restrooms, showers, and changing rooms! Enjoy a beach break getaway shore excursion at Grand Cayman's most popular beach, Seven Mile Beach. Your round-trip transportation will pick you up right from your cruise ship terminal. Full access to beach facilities! Visit the best highlights and sights - Heroes Square, King George Watch, South Sound, Flip Flop Tree, Peter St. James Castle and Conch Shell House! Optional shopping time at George Town Shopping District and 15 % discount on selected items! See the best of Grand Cayman on this half-day excursion and learn about the history and culture of the island, one of the top attractions is the Peter St. James Castle. 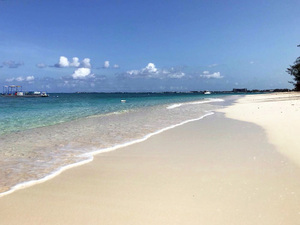 Enjoy one of the best-rated beaches in the world, Seven Mile Beach. Enjoy! Round-trip transportation from your cruise ship tender pier in Grand Cayman! Guided visit and rum tasting at Tortuga Rum Factory! Shopping visit at famous Tortuga Rum Cakes Factory! Access to beach facilities (showers, changing room, bar, restaurant, etc)! Free WiFi access at the beach club! A fun day shore excursion in the Grand Cayman! Learn distilling techniques and sample rum and beer with a Caribbean distinctive flavor. 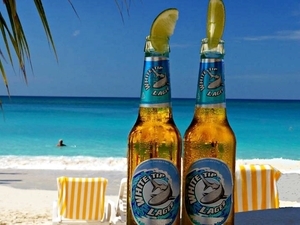 Then enjoy a beach break on Seven Mile Beach! 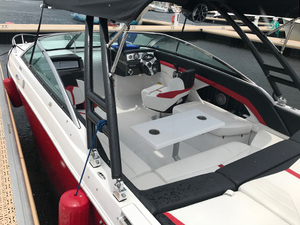 Complete with pick up and drop off at your George Town Grand Cayman Cruise Ship Tender pier.